With Žižek, you sort of have to take the good with the bad. Event falls into the category of the “bad”. He explains the philosophical concept of the “event” as developed primarily by Alain Badiou — though Badiou is only mentioned briefly toward the end as the person who largely developed this view of “events” 25 years ago. Anyway, an “event” is “[a]t first approach, . . . the effect that seems to exceed its causes” (p. 5) but it is further “the surprising emergence of something new which undermines every stable scheme” and jumps from one point to another through pervading deadlocks, (p. 7), in which “reality includes fiction (or fantasy),” and “the right choice only emerges after the wrong one.” (p. 95). Such an “event” is not inherently good or evil, it has no specific content. Žižek typically alternates between “big” and “little” books, with some newspaper pieces and other miscellany interspersed. His last “big” one was a reinterpretation of Hegel, Less Than Nothing: Hegel and the Shadow of Dialectical Materialism (2012). His last “little” one, aside from mere collections of interviews, was The Year of Dreaming Dangerously (2012). As usual, he borrows quite a lot from his prior works, I spotted bits lifted from In Defense of Lost Causes (2008), Less Than Nothing and The Year of Dreaming Dangerously without really looking that carefully. Although his “little” books are often more readable, due to less space for aimless digressions and uninteresting turf wars with other academics, this one lacks that readable quality. He addresses points he has made elsewhere, often verbatim, but shortens them to the point that they will hardly be comprehensible unless you have read his other works, possibly even multiple prior works. So, like Badiou, Žižek works out the position of continental philosophy that “ideology” has supremacy over “facts”. “In an event, things not only change, what changes is the very parameter by which we measure the facts of change, i.e., a turning point changes the entire field within which facts appear.” (p. 159). His arguments here seem flimsy most of the time. This is strange because he’s made these arguments before, more convincingly. There just does not seem to be a good reason for these arguments to be so curt and thin, conclusory even. He moves on to the next before it seems like he’s finished his prior thought. A book like this just encourages the man’s critics who label him a charlatan. It is for the most part uninteresting and superfluous. 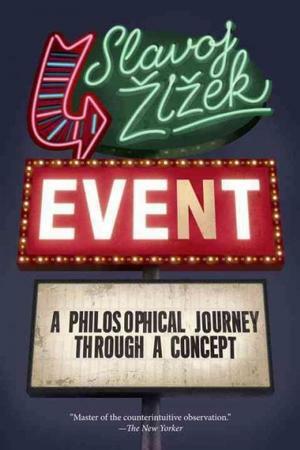 To the extent that there are a few small new ideas, better to wait until the next time, when Žižek recycles and expands them to the point where they are interesting and defensible. The man still has interesting things to say (take, for instance a recent newspaper op-ed, “ISIS Is a Disgrace to True Fundamentalism”). Some of that wit makes brief appearances here, like comments on how weird and lewd acts in public are not part of some sort of “regression” to an animalistic state but a continuation of the privatization of public space (akin to the “enclosure of the commons”) — it is public space that is disappearing, not private space. Event as a whole, however, seems like a throwaway.